Home cooks across Michigan love the great apples available in our state, perfect for cooking or eating on their own. Today, I’m guest posting for the Michigan Apples blog, sharing a recipe featuring Fuji apples. Summer might be half over, but there’s no end in sight for the dinners I want to make on the grill. I’ve been known to grill (at least occasionally) all year ’round, because you just can’t match the flavor of food prepared on the grill with any other technique. 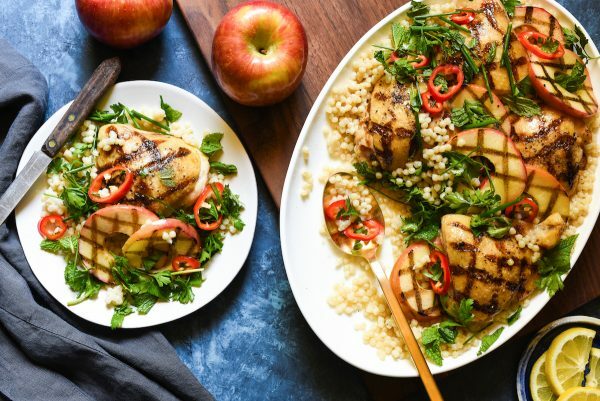 I keep grilling in earnest right on through the fall, which makes this Grilled Chicken & Apples with Couscous recipe perfect for when the Michigan apple harvest begins in August. I used sliced Michigan Fuji apples here, but any Michigan apple variety will work as long as you take care not to overcook it. 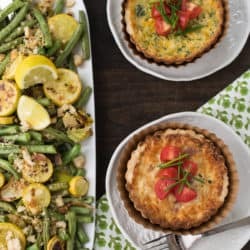 You’re looking for a tender-crisp texture – grilled just enough to begin to be tender on the outside of each slice, but still with a crisp bite in the center. This dinner comes together on one big, beautiful platter. Simply prepare some Israeli couscous according to the package directions, which should be pretty quick and easy. Meanwhile, head out to the grill to cook some bone-in chicken thighs (or any other pieces of chicken you might prefer) and the apple slices. 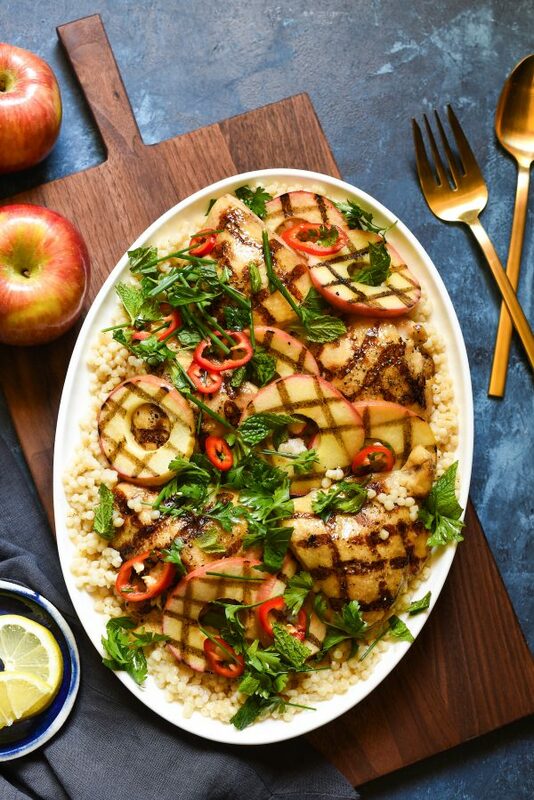 Pile the couscous onto a big platter and arrange the chicken and apples over. Drizzle everything with a simple vinaigrette made with maple syrup and apple cider vinegar for extra flavor. Then, it’s time for my favorite “home chef” technique – finishing the dish with a simple herb “salad.” I love it when restaurant chefs hit a dish with a small blizzard of herbs. It adds so much bright flavor in a super healthful way. Feel free to use whatever herbs you happen to have on hand. I used chives (because I have a HUGE chive plant growing in my backyard), parsley and mint. I tossed the herb salad with some fresh lemon juice and a thinly sliced Fresno pepper (jalapeño works too) for yet another layer of flavor and a bit of heat. 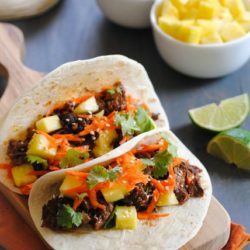 Keep this recipe in your back pocket as summer transitions to fall, but grilled dinners are still in your meal plan! Preheat grill for direct grilling over medium heat. Meanwhile, in small bowl, whisk together vinegar, maple syrup and a pinch each of salt and pepper. While whisking, drizzle in oil until all oil is incorporated. In medium bowl, toss Fresno pepper, lemon juice and herbs until well combined. Season chicken with salt and pepper. Transfer chicken to grill and cook 16 to 18 minutes or until internal temperature reaches 165 degrees F, turning occasionally. 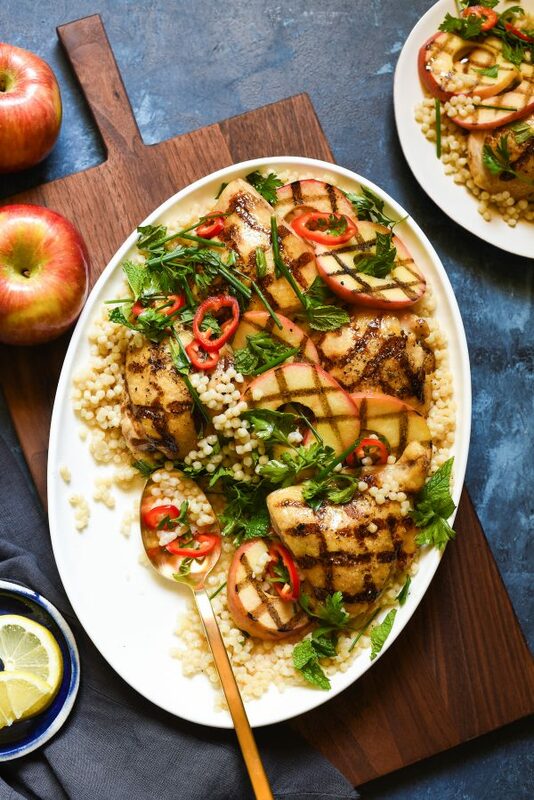 During last 5 minutes of chicken cooking time, transfer apple slices to grill and cook 3 to 5 minutes or until tender-crisp, turning occasionally. Meanwhile, prepare couscous according to package instructions. Spread couscous on large platter; arrange chicken and apples over couscous. Drizzle chicken and apples with maple syrup mixture. 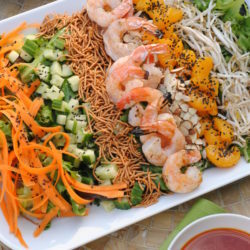 Sprinkle platter with herb mixture and serve immediately.